Following his presentation of Beren and Lúthien Christopher Tolkien has used the same 'history in sequence' mode in the writing of this edition of The Fall of Gondolin. In the words of J.R.R. Tolkien, it was ‘the first real story of this imaginary world' and, together with Beren and Lúthien and The Children of Húrin, he regarded it as one of the three 'Great Tales' of the Elder Days. This book will probably appeal mainly to serious Tolkien fans. It presents three different versions of the story The Fall Of Gondolin, one of which is complete but written in a very 'old world literary' style that I found hard going, and another of which is easier to read, more verbose, but incomplete. The book also includes a lot of commentary from Christopher Tolkien about the various versions, the reasons behind the final one being unfinished, as well as some other related works. His mother died when he was only twelve and both he and his brother were made wards of the local priest and sent to King Edward's School, Birmingham, where Tolkien shone in his classical work. After completing a First in English Language and Literature at Oxford, Tolkien married Edith Bratt. He was also commissioned in the Lancashire Fusiliers and fought in the battle of the Somme. After the war, he obtained a post on the New English Dictionary and began to write the mythological and legendary cycle which he originally called The Book of Lost Tales but which eventually became known as The Silmarillion. In 1920 Tolkien was appointed Reader in English Language at the University of Leeds which was the beginning of a distinguished academic career culminating with his election as Rawlinson and Bosworth Professor of Anglo-Saxon at Oxford. Meanwhile Tolkien wrote for his children and told them the story of The Hobbit. It was his publisher, Stanley Unwin, who asked for a sequel to The Hobbit and gradually Tolkien wrote The Lord of the Rings, a huge story that took twelve years to complete and which was not published until Tolkien was approaching retirement. After retirement Tolkien and his wife lived near Oxford, but then moved to Bournemouth. 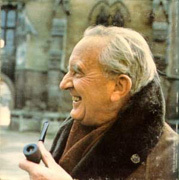 Tolkien returned to Oxford after his wife's death in 1971. He died on 2 September 1973 leaving The Silmarillion to be edited for publication by his son, Christopher.